First and second AP Top 25 victories, first AP Top 25 appearance, second NCAA Tournament appearance. The list could go on for the USD Women’s basketball team and their triumphs this season. The Coyotes didn’t lose inside the Sanford Coyote Sports Center, and finished the year 28-6 overall, 14-2 in conference play. They finished second in the Summit League during the regular season and lost to South Dakota State in the Summit League Championship game. Here are four takeaways from the Coyote women’s historic season. The end of the season is always a somber moment as every team loses a beloved senior class. For the Coyotes, the class was one star, Allison Arens. Arens, a 5-foot-10-inch guard from Crofton, Neb. was the heart and soul of this year’s Coyote squad. She found herself as the lone senior on Senior Night, where the entire crowd gave her a standing ovation as she played her final game inside the SCSC. Arens averaged 12.1 points, 5.3 rebounds and 2.9 assists per game this season. She racked up the milestones as well. Arens is one of three players in Coyote history with 1,300 points, 500 rebounds and 300 assists for a career. She finished her career eighth all-time in scoring with 1,410 points. She is the Coyotes’ all-time leader in free-throw percentage at 87.6 percent and joins USD alumna and current Dallas Wings player Nicole Seekamp as the only two Coyotes with three first-team all-Summit League selections. Arens also claimed Defensive Player of the Year in the Summit this season. If there was one thing in common between the Coyote women and men this season, it was solid defense. The Coyote women led the Summit League with 59.7 points per game allowed. They held opposing teams to shoot 38.3 percent, second in the Summit League to South Dakota State by 0.3 percent. Early in conference play, the Coyotes went on a defensive run where they held their opponents at 50 or fewer points for five consecutive games. During that stretch their average margin of victory was 34.2 points per game, with the closest game being a 71-49 win at Purdue-Fort Wayne. Arens finished second in the Summit League with 63 steals. Redshirt-sophomore Hannah Sjerven tied for seventh in steals at 47 and led the conference with 63 blocked shots. South Dakota was the last state to have a school go to Division I, and this season the state was represented twice in the NCAA Tournament. Both USD and SDSU made the tournament as the Jackrabbits received the automatic bid by winning the Summit League and the Coyotes were honored with the first at-large bid in the current Summit League configuration (Northern Illinois received an at-large in 1994). The Coyotes received a national spotlight after a home victory over then No. 23/22 Iowa State inside the SCSC on Nov. 28. The spotlight grew after the Coyotes notched another Top 25 victory on Dec 15 at then No. 22/24 Missouri. A pair of setbacks with losses to Indiana and Denver kept the Coyotes outside of the Top 25, but they continued to receive votes. The Coyotes finally broke into the AP Top 25 for the first time in program history on Feb 11. The following day, USD landed at 25 in the USA Today/Coaches Poll. One week later, the Coyotes peaked at No. 23 in both polls. A loss to South Dakota State pushed USD out of the AP poll, but the Coyotes lingered at 25 in the USA Today/Coaches Poll for three more weeks. With one senior departure, the Coyotes have plenty of reason to look forward to next season. Junior guard and first team all-Summit selection Ciara Duffy is one of four starters returning next season. The other three are juniors Taylor Frederick and Madison McKeever, and sophomore Chloe Lamb returning for her junior season. There are solid options for Summit League Coach of the Year Dawn Plitzuweit to plug in as the fifth starter in her motion system of ‘positionless basketball.’ Sjerven gives Plitzuweit height and a strong presence under the basket. Sophomore Monica Arens, sister to Allison, is a strong defender and has a growing ability to draw charges. 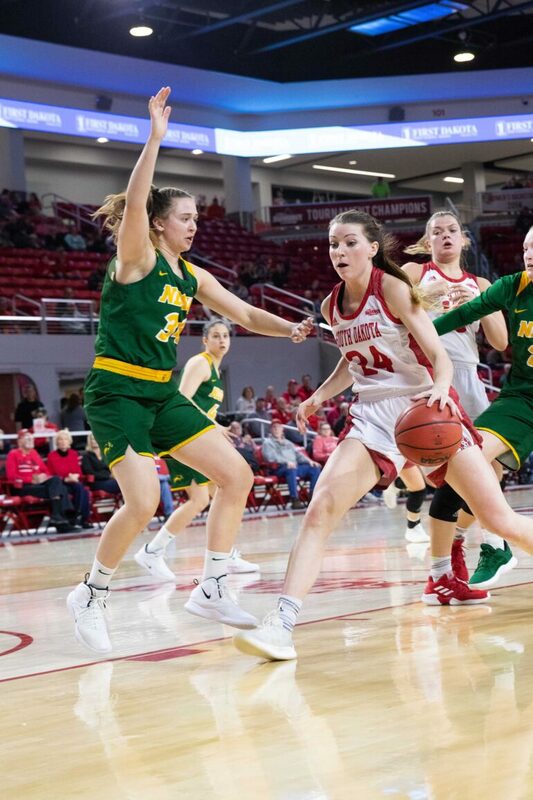 With South Dakota State losing their two senior stars Macy Miller and Madison Guebert, the door opens wide for the Coyotes to grab the Summit League title next season.